The first one is just plain ugly and I’ve deleted it a few times from the blog, but decided finally to keep it. I wanted so many things fitted in and I chose the smallest format. I didn’t even complete it, just grabbed a brush pen and filled in some rough lines. After Casey had left, I gave it another try, obstinate to get this scene in my pocket! I don’t feel much for this sketch…proportions are completely wrong, some ugly darks, even more cramped, in spite of a bigger format. Overall just a bad, disturbing painting that makes me want to come up for air.The third one I did this afternoon and decided it would be now or never. The plants need to get into the ground. I was still obstinate, so I kept to the same scene. I used an even larger format and this time I did use all the space. There is still too much detail and finicky pieces and not enough depth, but this it! I still can’t say what it is I wanted to do differently. I at least hope this last one broke my spell. You’re too hard on yourself! And anyway, trying something different is always with doing! 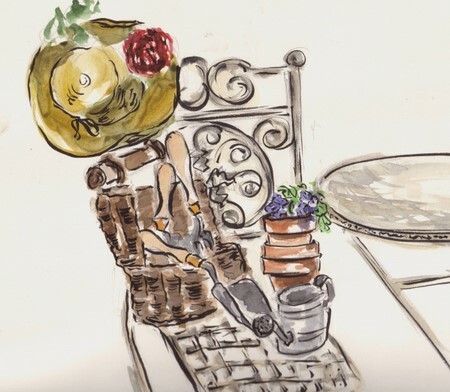 I like the way you made the table and chair less of a focal point in the third try….it doesn’t compete for attention. I want a table and chair set like the one you painted. I bet your garden is beautiful! I love them all! This was a hard subject and your really stuck with it. I wish I could come out with you and Casey!! Lucky you. p.s. This is supposed to be “FUN”. No being mean to yourself! Third time is the CHARM! I really like this! It’s so “SPRING.” Truly, this would look fantastic framed and hung on a sun porch. 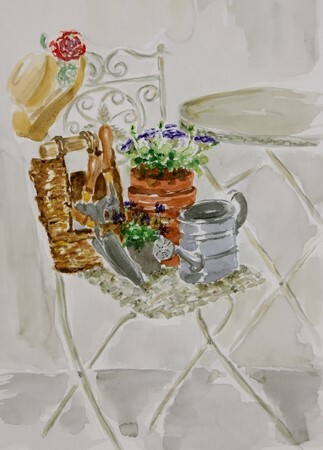 I love all the objects (particularly fond of the hat) and the pop of color from the pot of flowers is just perfect. Thanks for posting all three! It’s really encouraging to see the progression and perseverance!! Bravo to you for your persistance. I love the third one but I also like the other ones too. It looks like a difficult subject, and I’m sure you learned a lot on the way. Ronell, all three of these came out great. I don’t think the first one is ugly at all, as a matter of fact I think it’s full of charm. On the second one you’ve done an incredible job on the chair – you can just feel the texture of the metal basketweave, and the third is light and airy. 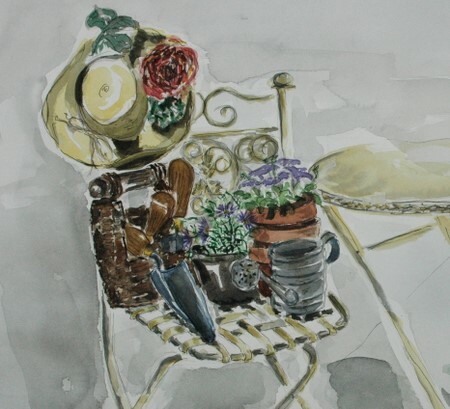 You have a distinctive style in watercolor, very elegant and yet relaxed(very French somehow) that brings to mind illustrations from the 1950s. Actually, I really like the quality of the lines on the first one, and I also like the tones of the wash. The third one has a nice quality of light to it, and I love the flowers, particularly the flower on the hat. It’s a beautiful composition overall, so well done for sticking with it! I think it bore fruit, don’t you? Glorious taste of springtime, I love your work and envy you and Casey and your challenge/committment – Can’t wait to see them each week, who knows maybe I can join in some time. What a dedicated artist you are! I love all of them. And, I’m glad you posted all of your tries. Each one has something special that the other doesn’t have. Good for you to keep going until you get what you were striving for. The funny thing is that my favorite is the first one. I know it didn’t capture the look you wanted but it’s still a wonderful piece. The last one is technically better but the first one is full of energy and expressiveness somehow. They’re all worthy of appreciation though and not at all ugly! All three are wonderful but I too especially like the first one.All the best with your new goal. well, the first one has it’s own charm, What I like about the 2nd one is the chair and compositon. The 3rd is light and airy and just as lovely. So where is France are you and Casey? I will be in paris for 8 days in October…just roaming and skething…maybe we can meet and paint? Well, I love the last one, so I guess the third time is the charm, although I don’t know how you did three paintings of the same thing — all in a row! I would have been pulling my hair out! 🙂 All three have their good bits, though, as I think has been well stated by earlier commenters. thank you for all the comments…much apprecaited! Don’t be so hard on yourself. Any time you step outside your comfort zone, you are going to be challenged. Not only on how you see your subject, but on how you interpret it also. I think these are wonderful little sketches. Keeping playing with them and something will come out of it that will satisfy you. Just remember, it’s always a learning experience. Previous Previous post: Come on, just do it!